You are going to love these classic vegan waffles! They are super quick and easy to make and they are golden crispy on the outside and perfectly fluffy on the inside. We love them as breakfast and dessert! You definitely don’t have to miss out on waffles when you become vegan! It’s so easy to make vegan waffles. We make these classic waffles all the time and if you want you could even change up the recipe a bit and add chocolate chips or berries. So yummy and easy! They are golden crispy on the outside and perfectly fluffy on the inside. They are quick and easy to make. You need just one bowl and your waffle maker. Try them with coconut vegan whipped cream or even with vegan vanilla ice cream on top. You won’t believe how delicious this is! It’s breakfast AND dessert in one! They are amazing with maple syrup drizzled on top and fresh berries. 1. STEP: Combine all ingredients for the vegan waffles in a medium bowl. 2. STEP: Using a hand whisk, stir well until all lumps are removed. The batter will be quite thin. Don’t worry, that’s normal! 3. STEP: Heat your waffle maker and grease it with coconut oil or canola oil on both sides (top and bottom). Pour the batter with a ladle into the waffle iron. It depends on your waffle maker how much batter you need, so check the manufacturer instructions. 4. STEP: Close your waffle maker and bake the waffles for about 5 minutes until they’re golden and crispy on the outside. Don’t open the waffle maker too early. 5. 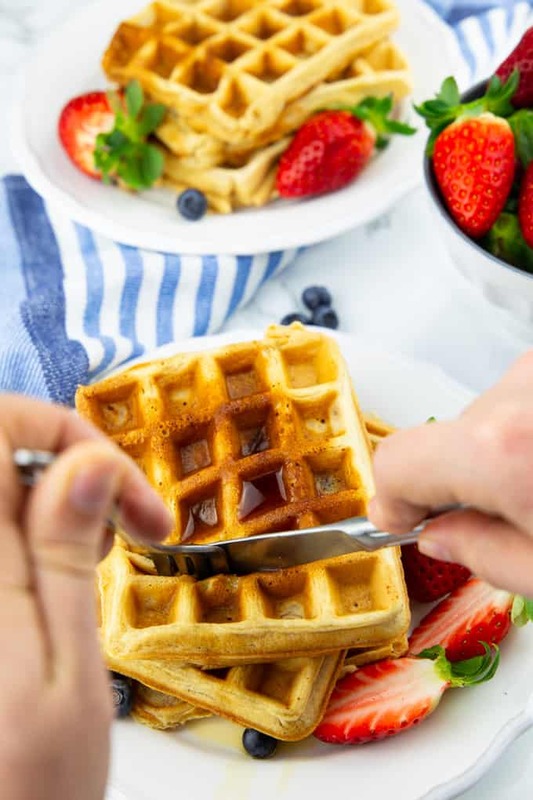 STEP: Serve the waffles immediately with maple syrup and berries or other fruits. Enjoy! It depends a bit on your waffle maker how long the waffles take. Mine took about 5 minutes, but they can also take up to 7 minutes. Make sure not to open the waffle maker too early. Many waffle irons have a green light, which tells you when the waffles are ready. I recommend checking the manufacturer instructions to see if you have to grease your waffle iron or use a non-stick spray. Some require it and others don’t. I usually use coconut oil for my waffles, but the recipe also works with canola oil or melted vegan butter or margarine. Don’t worry if the batter will be quite thin. That’s totally normal! With my waffle iron, I got six large waffles out of the waffle batter. Depending on the size of the waffle maker you use, you might get more waffles out of this recipe. I used almond milk for my waffles, but the recipe also works with soy, oat, or cashew-based milk. So feel free to use any plant-based milk you like! Can I make these vegan waffles gluten-free? Yes, absolutely no problem! I recommend using a gluten-free flour blend if you want to make these waffles gluten-free. Buckwheat flour will probably also work well, but I haven’t tried this yet. So let me know if you give it a try! Yes, these waffles freeze really well. Line a baking tray with parchment paper and place the waffles on top. Put the baking sheet in your freezer until the waffles are fully frozen. This will take about two hours. Then transfer the frozen waffles to freezer bags or containers. They will last in the freezer for 3-4 months or even longer. To reheat them, just pop them in the toaster until they’re warm and crispy! So easy! Is it possible to add any add-ins? I hope you like these vegan waffles as much as we do around here. If you give them try, I’d love to know what you think about them. Just leave me a comment and a star rating below. Your comments really make my day! Combine all ingredients for the vegan waffles in a medium bowl. Using a hand whisk, stir well until all lumps are removed. The batter will be quite thin. Don't worry, that's normal! Heat your waffle maker and grease it with coconut oil or canola oil on both sides (top and bottom). Pour the batter with a ladle into the waffle iron. It depends on your waffle maker how much batter you need, so check the manufacturer instructions. Close your waffle maker and bake the waffles for about 5 minutes until they're golden and crispy on the outside. Don't open the waffle maker too early. Serve the waffles immediately with maple syrup and berries or other fruits. Enjoy! I recommend checking the manufacturer instructions to see if you have to grease your waffle iron or use a non-stick spray. Some require it and others don't. Don't worry if the batter will be quite thin. That's totally normal! « Carrot Pasta – Vegan and Super Creamy! Did you add a flax egg instead of apple sauce?? Just had them for breakfast with maple syrup and raspberries! So good! So yummy!! I made them for my two boys (5 and 7) and myself and we all loved them! Next time I’ll double the recipe and freeze some for later. These vegan waffles are definitely 5 stars!! Thanks! Holy moly, these turned out sooooo delicious!! Perfect Sunday morning breakfast! And I love how easy the recipe is!